Me and a good friend made a bet nearly a decade ago. The bet was based on achieving a certain successful point in our careers. If he won, he owed me a Lamborghini. If I won, I owed him a Ferrari. I know, sounds backwards. But that’s the way it went. Well, I lost. And I acknowledge that the bet was likely backwards. 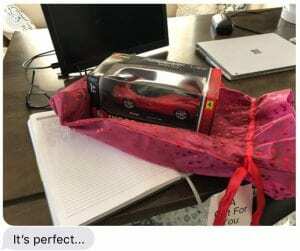 So I bought him a Ferrari. A budget Ferrari still counts, yeah? At least he liked it (pic). But I do think it’s important to remember the little things, your word, inside jokes, etc. They don’t matter much to many, but they make all the difference to me. Shows you care.